« Getting Old, or Should I Say Aging? My friend Chris and I went to see Gloria: A Life, the Gloria Steinem one-woman show. The play is closing in New York City at the end of this month, but it will be traveling to other parts of the country that Gloria changed during the ’60s, ’70s, and ’80s. I wasn’t sure what to expect. I have met Gloria at dinner parties in the Hamptons, where I found her to be soft-spoken and not bra-burning at all. And, while I’m 66 and should have had her as the fabric of my life as an influencer, I spent the better part of the ’70s at the University of Nebraska, where Nixon’s resignation was on page two. I’m sort of not exaggerating. So, she wasn’t on my ‘friends’ list. Gloria: A Life takes us through the trajectory of not only Gloria’s personal journey through her journalism career, harassment, and enlightenment to the plight of women and the opportunity to change the outcome for the next generations, but also the sisterhood of the women of color, who really started it all and embraced her as their token white woman. Who knew? History unfolds before us — not the “war to war” history that men have always injected into our education, but rather cultural history and women’s history … and it’s Glori-ous! I thank her and those less well known for their commitment. Abortion and women’s rights over their own body take on a predominant role in the unfolding of the journey we are still navigating. The play’s actors pointed out that each of us in the room had our own experience around “Glorias.” This was true for most of us in attendance, as the majority of the audience members were women, and more than half were over, let’s say, 50. During my days at the University of Nebraska, I dined each night with my sorority sisters in the Pi Phi dining room. Every now and then, a hat was passed, and everyone put in whatever money she could spare. No one knew whom it was for, but abortion was only available in New York City in the early ’70s, and the hat’s bounty would pay for the flight for one of our “sisters” to fly there and have the procedure performed. By herself. Alone. Because that was all that was available to us. I put in whatever I could with pride and commitment to her right to choose. I can honestly say that in the three years I called that sorority house “home,” I don’t recall anyone having left school to have a baby (which women would have had to do back then), but I do remember a number of “pass the hat” moments. Yes, we all have our own experiences of that time in history, and my only regret is that it wouldn’t be for years that I would join the movement to commit to my own gender’s growth and equality. I never subscribed to Ms. magazine. Never read it. Thought burning a bra was silly (and still do). But I also didn’t realize what the play so gently but powerfully lays out: how male dominance over our lives and our views of ourselves has been nurtured since birth. And I didn’t have a prayer of knowing how to silence that as I charted my own course. A man close to me said to me on the phone yesterday, “You have no trouble speaking truth to power.” That may be true now, but throughout most of my adult life, I was clueless as to what that truth was. Gloria and her gang of girls helped each other out of the darkness of their indoctrination. And being present in the play helped me see how I gained clarity as well. For me, one of the best parts of the night was a group of six young girls, maybe 8 or 9 years old, who were sitting across from me in the top row. They loved the play. They hung on every word, and when two of them spoke in the ‘chat with the audience’ afterward, they were articulate and cool, but more importantly, excited about the future they could fashion. 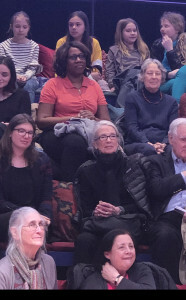 One of them said of another: “She’s the president of our group; I’m like the vice president.” This was cause for some concern, because one of the moments of clarity in the play was when the light bulb went on that we women need to participate with equal input in roundtable discussions. This stands in stark contrast to the pyramid paradigm established by men, in which a king sits at the top of those who are climbing over one another to get to his position. Like a board room table that always has a seat of power. Not all men. And especially not those in the audience. One man’s daughter told us her father had asked her to see the play with him. Thank you, Gloria, for all that you’ve done. Thank you to the girls in the top row for all you will do. It was nice, in this moment of our history when I have little hope, to leave feeling like maybe there is hope, after all. Women are the answer. How cool is that? One of my very favorite Freesia Lane reviews!! Well done! !